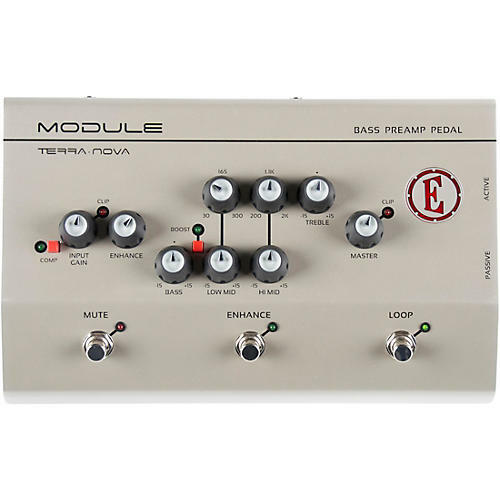 Module from Eden is a bass preamp pedal based on the company's Terra Nova amplifiers. It features the semi-parametric EQ section, as well as the Enhance EQ sweep, Bass Boost and switchable compressor. Module also includes three foot-switches to toggle the Mute, Enhance and Effects Loop easily whilst playing. Use the Module to take your sound to the front of house, recording desk or your existing power amp, or use the headphone output and 3.5mm line in connectivity to rehearse without disturbing the neighbors. Module is the perfect travel companion.